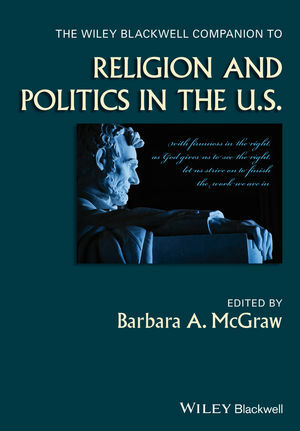 The Wiley Blackwell Companion to Religion and Politics in the U.S. provides a broad, inclusive, and rich range of chapters, in the study of religion and politics. Arranged in their historical context, chapters address themes of history, law, social and religious movements, policy and political theory. Draws together newly-commissioned essays by distinguished authors that are cogent for scholars, while also being in a style that is accessible to students. Provides a balanced and inclusive approach to religion and politics in the U.S.
Barbara A. McGraw, J.D., Ph.D., is Professor, Social Ethics, Law, and Public Life and Director of the Center for Engaged Religious Pluralism at Saint Mary's College of California. Her publications in religion and politics and comparative religions include Many Peoples, Many Faiths, 10th Edition (with Robert S. Ellwood, 2014), Taking Religious Pluralism Seriously (with Jo Renee Formicola, 2005), Rediscovering America's Sacred Ground (2003). She has served on the American Academy of Religion standing Committee for the Public Understanding of Religion, as co-chair of AAR's Religion and Politics Section, and on the American Political Science Association Religion and Politics Section Executive Committee.